The painter Torggler studied at the Academy of Fine Arts in Munich under Wilhelm Diez and Gabriel von Hackl. At the outset, he was strongly influenced by the Portraiture of Franz von Lehnbach. In 1908, Torggler received a prize from the city of Graz and in the same year, he moved to Vienna. Shortly afterwards, he effected a journey to Paris, where he came into first-hand contact with French Symbolism. The voyage was instructive and it confirmed stylistic orientations that were exemplified by his series idealized portraits of famous writers and composers, Shakespeare, Schiller, Wagner, Beethoven, Mozart and Schubert , published as postcards by F. A. Ackermann in Munich. During the First World War, Torggler was active as a war painter in the press corps, where he realized portraits of the military brass, several of which are in the Museum of the History of Man in Vienna. Torggler’s works, always of admirable artistic quality, were greatly admired by the bourgeoisie and upper classes. He executed portraits of the Princess Auersperg-Goldegg, Prince Hugo Weriand Windisch-Graetz, the young Princesses Lotte and Netti von Fürstenberg-Donaueschingen, the Count Johann Albrecht von Mecklenburg, the General Franz Conrad von Hötzendorf, among many others. 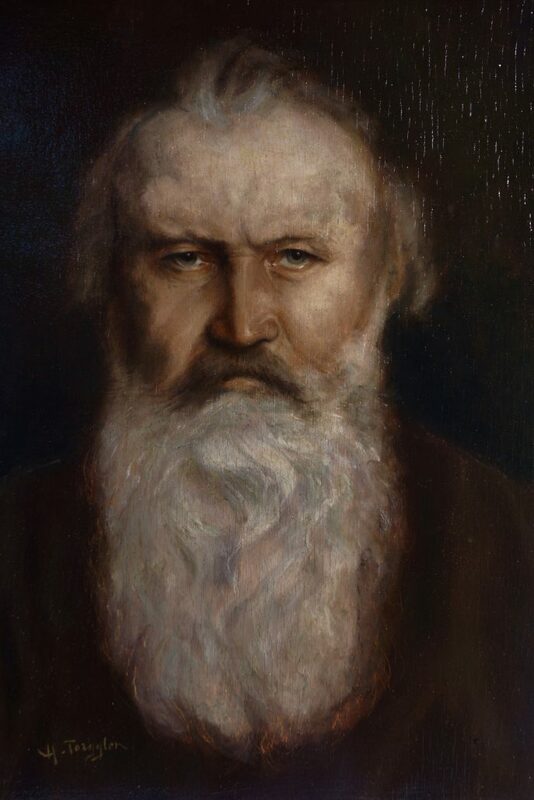 Amazingly, while there are several photographs of Johannes Brahms, there are very few images drawn from life and no confirmed lifetime paintings, an extremely odd circumstance given the composer’s enormous reputation. Brahms died in 1897, when Torggler was 19 years old. Some have suggested, since Torggler was a music lover living in Graz (which lies only a short train ride from Vienna), that the young man voyaged to the capital to see performances at the Staatsoper or the Musikverein. In so doing, he might have encountered the composer in the flesh. This intriguing hypothesis has neither been confirmed nor dismissed. Nonetheless, the artist’s striking and much admired portrait of Brahms, mysterious and compelling, strongly evokes, in the viewer’s imagination, the composer and his music. In this regard, Torggler’s painting is comparable to and certainly as valid as – the Symbolist portraits in homage to Beethoven that proliferated at the turnof-the-century, painted and sculpted by masters such as Max Klinger, Franz von Stuck or other gifted artists. 1. Thieme/Becker: Allgemeines Lexicon der bildenden Künstler. volume 33, pg. 289.